This historic London derby has provided some cracking contests across all competitions as pretty often meets power in this rivalry. 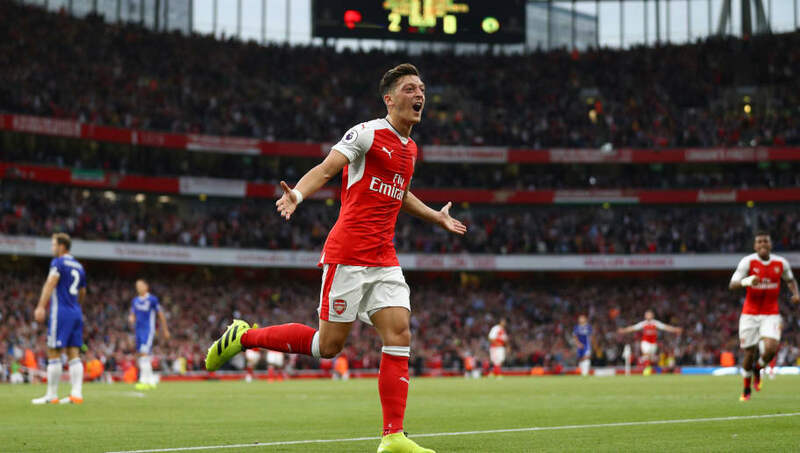 Arsenal have the better overall record in this fixture, winning 75 compared to Chelsea's 63 in all competitions, but in recent years Chelsea have largely had the better of the Gunners - becoming the first away team to win three times at the Emirates Stadium. Chelsea legend Didier Drogba bullied Arsenal for many years, scoring 13 goals in total, with Thierry Henry also enjoying this fixture; netting eight times in 12 games. 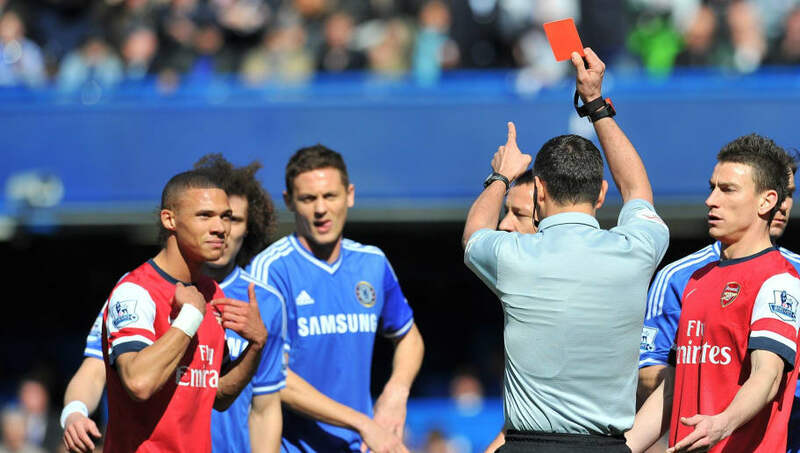 Arsene Wenger will never forget his 1,000th game in charge of Arsenal, as they fell to a 6-0 defeat at Stamford Bridge - a game which will always be remembered for referee André Marriner sending off Kieran Gibbs for a deliberate handball committed by Alex Oxlade-Chamberlain. Though a hugely controversial moment, the game was already done and dusted as Eden Hazard made it 3-0 from the resulting penalty after just 17 minutes. Goals from Samuel Eto'o, Andre Schurrle, Mohamed Salah and a brace by Oscar gave Chelsea their biggest ever win over Arsenal and Wenger his heaviest margin of defeat as manager. Three first half goals from Alexis Sanchez, Theo Walcott and Mesut Ozil gave Arsenal an unassailable lead at the break. It was the first time Arsenal had scored against Chelsea since 2013 and their first win over the Blues since 2011. A mistake at the back by Gary Cahill set Arsenal on their way to their biggest victory over Chelsea in 19 years, however Chelsea fans will look back on this defeat as the catalyst for their 2016/17 title win. Antonio Conte brought on Marcos Alonso in the second half, switching to his infamous 3-4-3 formation for the first time. 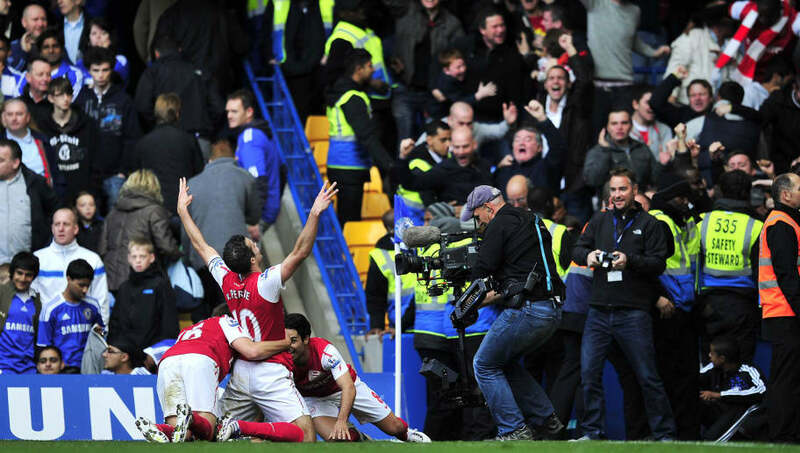 A Robin van Persie hat-trick was the difference between the two sides in this eight-goal thriller which saw Arsenal come from behind twice in what was an incredible Premier League match. Chelsea led 2-1 at the break but an astonishing second half saw Andre Santos and Theo Walcott put Arsenal 3-2 up with ten minutes to play. Juan Mata equalised before a misplaced pass by Florent Malouda sent John Terry tumbling to allow Van Persie the freedom of Stamford Bridge and round Petr Cech. A dream afternoon for Van Persie was capped off by a superb injury-time strike with his left-foot which wrong-footed Cech and flew into the top left corner to send the travelling fans berserk. This Champions League quarter final was finely poised going into the second leg at Highbury. The tie was all-square following a 1-1 draw at Stamford Bridge with goals from Eidur Gudjohnsen and Robert Pires. Arsenal's 'Invincibles' would have fancied themselves at home with an away goal in the bag, and Jose Antonio Reyes' opener put the Gunners in pole position. An equaliser from Frank Lampard five minutes later levelled the tie and Gudjohnsen missed a sitter with minutes to play. But in the 87th minute, Wayne Bridge slotted it past Jens Lehmann to become the unlikely winner and send Chelsea to the semi-final - a moment that brought Chelsea boss Claudio Ranieri to tears. This was Arsenal's second loss in a week following defeat in the FA Cup semi-final to Manchester United at Villa Park. Invincibles, eh? Chelsea went into the 2017 FA Cup Final as clear favourites on the back of their impressive title win under Antontio Conte. 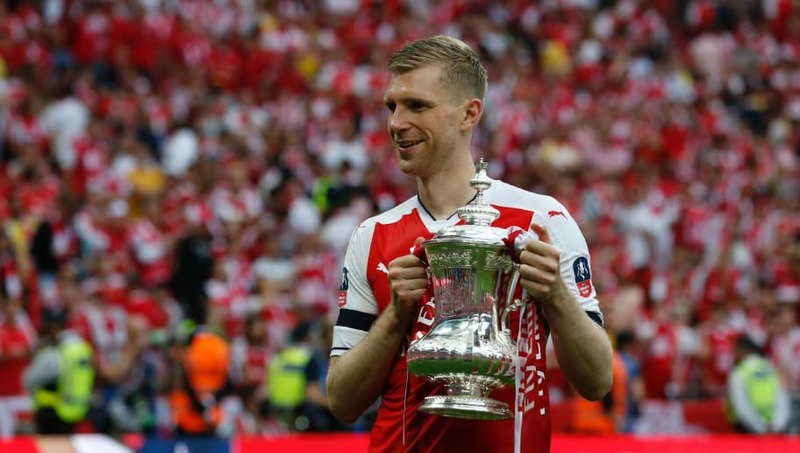 But the Blues were not at the races and Arsenal earned a deserved 13th FA Cup trophy with a back three of Rob Holding, Nacho Monreal and Per Mertesacker. A controversial goal by Alexis Sanchez gave Arsenal an early lead, and a second yellow was shown to Chelsea's Victor Moses for simulation to make matters worse for Conte. Diego Costa wrestled the game back for Chelsea with a 75th minute equaliser but Arsenal immediately raced up the other end and Aaron Ramsey scored his second winning goal in a FA Cup Final. Due to his performance and having not started a game of football in 392 days before kickoff, this final is affectionately known as The Mertesacker Final by Arsenal fans and former players. The most action-packed game of this selection. A man of the match display by who else but Didier Drogba gave Chelsea a memorable 2-1 win in Cardiff. A 17-year-old Theo Walcott put Arsenal ahead in the Millennium Stadium before Drogba's brace - a trademark header from Arjen Robben's cross won the game for Jose Mourinho's men. But the game will always be remembered for the wrong reasons. John Terry was left unconscious after a kick to the head from Abou Diaby and was stretchered off. The full-time whistle wasn't blown until the 102nd minute due to a bust-up between Frank Lampard and Cesc Fabregas which resulted in a mass brawl between players as well as staff. Referee Howard Webb sent off John Obi Mikel, Kolo Toure and Emmanuel Adebayor, who was alleged to have punched Wayne Bridge. This was later found to be Emmanuel Eboue, resulting in a three-match ban for the Ivorian. 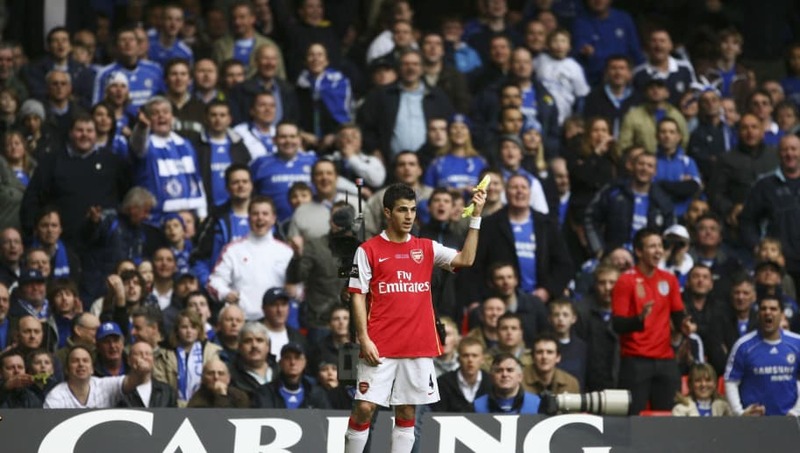 Arsenal players also complained about being pelted with celery by Chelsea fans, which forced the club to ban their beloved vegetable from Stamford Bridge.